Initially I was planning on making a Pumpkin Spice Latte with some leftover pumpkin puree, but, then I came across a recipe for Baked Pumpkin Churros and I decided that my puree would be put to better use making them. The batter came together quickly – less than fifteen minutes – and it was easy to pipe it on a parchment lined baking sheet to pop in the oven. While I didn’t try it, I am sure you could fry these if you want a more traditional churro, the downfall of that of course is that frying them means they won’t keep as well as baking them. Once baked I sprayed them with cooking spray and rolled them in a cinnamon-sugar mixture to give them the traditional churros coating. And finally I made hot fudge for dipping… YUM! Preheat the oven to 400 F. Lay 2 same-sized baking sheets on top of one another and line the top sheet with parchment paper. 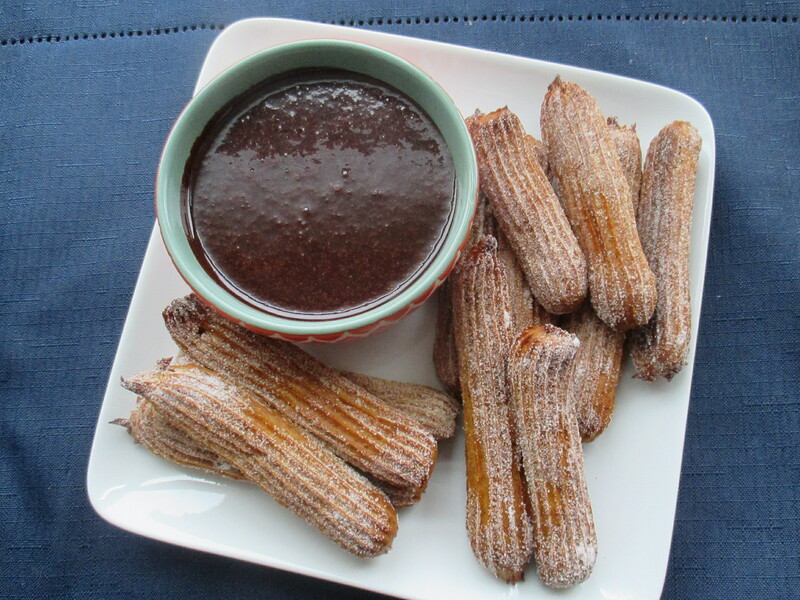 Using 2 baking sheets will prevent the bottom of the churros from burning. In a medium saucepan combine the water, pumpkin, butter, brown sugar, 1 tsp. of cinnamon, nutmeg, ginger and cloves. Cook over medium-high heat, stirring frequently until the mixture boils. Remove from the heat and add in the vanilla extract and flour and stir with a rubber spatula until the dough comes together and forms a smooth dough. Transfer the dough to the bowl of an electric mixer (or a large bowl if using a hand mixer) and let it rest for 2 minutes. On low speed add in one egg and mix until well combined, increasing the speed if necessary. Repeat with the second egg. Transfer the dough to a large piping bag with a large star tip (I used a Wilton 6B tip). Pipe the dough onto the prepared baking sheet. I ended up piping churros that were about 4 to 5 inches in length. You could pipe them smaller or larger. Bake in the preheated oven for 25 – 35 minutes. The length of time will depend on the tip used and the length of your churros. In a shallow dish combine the sugar and remaining cinnamon. Once out of the oven, spray the churros with the cooking spray (top and bottom) and roll them in the cinnamon-sugar mixture to coat. Transfer to a wire rack. Eat them alone or with hot fudge sauce. In a medium saucepan, whisk together the sugar and cocoa powder. Whisk in the cream, then turn the heat to medium and continue whisking as the mixture warms up. Once the mixture is warm add the butter and stir to melt. Once hot, add the vanilla and stir to combine. Turn off the heat and let the sauce cool in the pan for 5 minutes and then transfer to a heat-proof container. Store in the refrigerator. It will become solid as it cools. When using, just spoon out your desired amount and heat in the microwave for 20 seconds, stir and then heat for an additional 10 seconds or until your desired temperature.